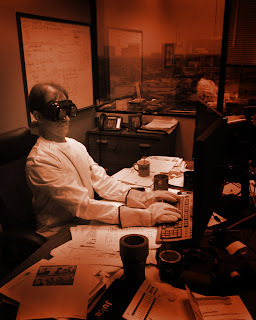 Aaron, our resident mad scientist, hard at work on version 7.0! Great news: we're in limited beta testing for the new version. Our focus has been the flowsheeting tools (symbols, streams, look and feel), and you'll still see a number of engineering improvements (a gas membrane UnitOp is coming, for example). We are incorporating a much more modern toolset with an eye toward (1) fitting in with other drawing/flowsheeting tools standards, and (2) addressing the 6 years of feedback from the 6.X versions. Nothing too scary, so stay tuned here for more information. I suppose we should feel flattered that our competitors feel it necessary to address us directly in the marketplace, and I do understand the need for comparison. 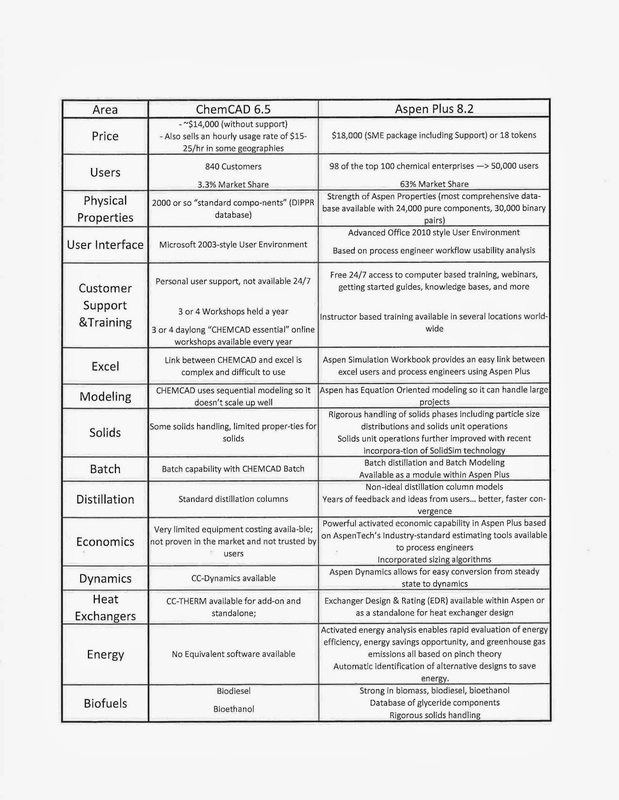 Often customers ask us, "What's the difference between CHEMCAD and the others?" Here's the bottom line: rarely, if ever, will one simulator company know enough about the others to offer a truly useful comparison, and it would be expecting too much to believe that you're getting an unbiased comparison. If you want to compare, don't hesitate to ask for a comparison, but do your own evaluation by asking for a trial license. I can't stress that enough. Use the trials to simulate your processes with any and all software packages you're considering. Test drive the customer support facilities. Call the hotlines. Send emails. Search the customer portals. Yes, it will take longer than asking the sales groups at each competitor to compare themselves, but it's critical and time well spent. Also sells an hourly usage rate of $15-25/hr in some geographies"
Jumping right into the CHEMCAD side of things: CHEMCAD is a suite of several modules (see here), so this price appears cherry-picked to be close to a 1-year commitment for just our CC-STEADY STATE module. Longer commitments and prepaying can significantly discount that amount. Oh, and support (and upgrades) are included in our license fees. We do offer multi-year, yearly, monthly, and even hourly options. Again, any price comparison ought to be done using the specific modules and licensing terms you want. Contact us- it's a painless process to have our teams come up with a price for you. We do have over 800 active organizations using the software, however, this comparison is a bit misleading. For our industrial customers, a single license is shared by an average of 5-6 users. At academic institutions, there may be as many as 200 users. Yes, our competitors dominate the largest CPI organizations, and we too have licenses at many of those same organizations on the desktops of engineers who prefer our products. According to Aspen Technology's most recent annual report, they claim 1,750 customers. Regarding market share, I'm not sure what to make of these numbers. What I can say is that they have more than we do. If that's a metric you want to use in your decision making, just make sure you understand that Chemstations only does simulation software. It's our passion, and it's our focus. "2000 or so 'standard components' (DIPPR database)"
We are a licensed DIPPR distributor, and we offer over 2,200 components to our users. In addition, we have over 10,000 binary interaction pairs for a variety of our thermodynamic options. However, I would again like to point out the importance of trying out the software(s) to see if your chemical components are available. Talking about 2,200 or 24,000 components isn't relevant if (1) both software packages have your components, (2) neither package has them, or (3) the data is sparse and/or inaccurate. I'm not sure what "Microsoft 2003-style" is, and I'm not sure it means the same thing to all people. Our interface is currently undergoing a complete overhaul (watch for a coming blog post about version 7.0! ), but the 6.X versions were built using a very involved process of face-to-face interviews with a cross section of our user base to identify core workflows. And it's built with 25 years of history and our reputation for ease of use. I'm sounding like a broken record, but you ought to put this to the test with a trial. 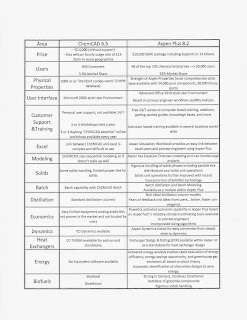 3 or 4 daylong 'CHEMCAD Essential' online workshops available every year"
Again, I don't know what "personal user support" is, so I'll describe our system. We have trained engineers, who are CHEMCAD experts, available by phone and email throughout the business day in both Houston, TX, USA and Berlin, Germany. We provide a customer portal which tracks customer support tickets and allows you to follow the progress of any issues requiring a high level of interaction (file exchange, etc.) and a knowlegebase of common support issues. We do provide workshops around the US, webinars throughout the year, and importantly, we offer on-site training. Finally, our 'Essentials' videos are available on demand at our YouTube channel. "Link between CHEMCAD and excel is complex and difficult to use"
Put our Excel Data Map to the test. It's very powerful and you can create a lot of value with it. If you think it's "complex and difficult to use," don't hesitate to tell us. Here is a recent paper which includes an application of our Data Map. "CHEMCAD uses sequential modeling so it doesn't scale up well"
We use a sequential modular solver by default, and we offer a simultaneous modular solver. Scale-up to large numbers of unit operations, in steady state or dynamics, is not an issue. Here is a paper detailing a very large, dynamic model where CHEMCAD "scaled up well." And while we are on the topic of "modeling," we can also do a momentum (pressure) balance across the flowsheet at the same time we are doing the heat- and material- balances. "Some solids handling, limited properties for solids"
We have particle size distribution calculation, solids unit operations, and you can declare any component in your flowsheets as a solid to remove it from phase equilibrium calculations. Solid properties for many components come from DIPPR, and we also provide solid-liquid equilibrium (SLE) calculations. "Batch capability with CHEMCAD Batch"
CC-BATCH is a batch distillation specific application. With our CC-DYNAMICS module, you can model dynamic, batch, and semi-batch processes (including tank reactors with reaction kinetics and heat transfer calculations with a jacket, a coil, or both). We provide equilibrium stage SCDS and Inside-out (TOWR) unit operations. We have reactive distillation within the SCDS. We also have mass-transfer-based models for trays, random packing, and structured packing. We can run these in steady state or dynamics (including dry startup and shutdown). Oh, and we have incorporated "years of feedback and ideas" also. Twenty five years as of 2013, if you're counting. "Very limited equipment costing available; not proven in the market and not trusted by users"
Equipment costing is not our business. We provide a tool which does a good job of relative costing (one process versus another). We do not sell on the idea that we provide accurate, absolute costing. We do provide a variety of unit operation sizing algorithms that can be sent to rigorous costing packages or to equipment vendors. Finally, the code for our costing is user-accessible, so you can edit it directly and use your costing code. CC-DYNAMICS, our dynamic process simulation module, is available as an add-on to CC-STEADY STATE or as a standalone package. "CC-THERM available for add-on and standalone"
CC-THERM, our heat exchanger rating and design tool, is available as an add-on to CC-STEADY STATE or as a standalone package. You can even run a flowsheet using the actual performance predicted by the geometry of the exchanger for a more rigorous simulation (we call this "simulation mode"). We don't have software that makes any attempt to automatically optimize energy use. We provide an optimization routine (which can handle integer values), and we use a variety of software protocols (OLE, COM, OPC, CAPE-OPEN) if you would like to connect an external optimizer. We have a large number of customers in the biofuels business, from folks who design the facilities to those who operate them. Test drive us if you want to see whether your process is supported (I'd bet it is). To sum up- it's best to take a comparison written by a vendor (even us!) with a large grain of salt. For a true comparison, ask for a trial. Use customer support. Ask for, and call, references. We certainly want your business, and we want to help you create value for your organization.